"My cousins grew up on a reservation in South Dakota, and this is how we always made our fry bread (with yeast)." Mix yeast, sugar, and 1/4 cup warm water in a large mixing bowl and set aside until the yeast mixture forms a creamy foam layer on top, about 5 minutes. Whisk flour, 1 teaspoon salt, and baking powder in a bowl. Stir flour mixture into yeast mixture by thirds, alternating with 1 cup warm water in thirds, and beat to make a firm dough. Cut the dough into 6 pieces and roll each piece into a ball on a floured work surface. Roll out the dough balls into flat round tortillas. Heat vegetable oil in a deep-fryer or large saucepan to 350 degrees F (175 degrees C). Gently place tortillas, one at a time, into the hot oil and fry until golden brown on both sides, turning once, 2 to 3 minutes per side. Drain on paper towels and set aside. Cook and stir ground beef with 1 large minced onion in a skillet over medium heat until the meat is browned and crumbly, about 10 minutes. Drain excess grease and stir in diced tomatoes with their juice, tomato paste, basil, oregano, salt, black pepper, and chili powder. Bring the chili to a boil and reduce heat to low; simmer until thickened, 30 to 40 minutes. Place a piece of fry bread onto a plate and ladle a generous portion of chili onto the bread. Transfer Cheddar cheese, lettuce, 1 cup finely chopped onion, and mild green chilies into separate bowls and top each portion with about 1 tablespoon of Cheddar cheese and desired amounts of lettuce, onion, and chilies. 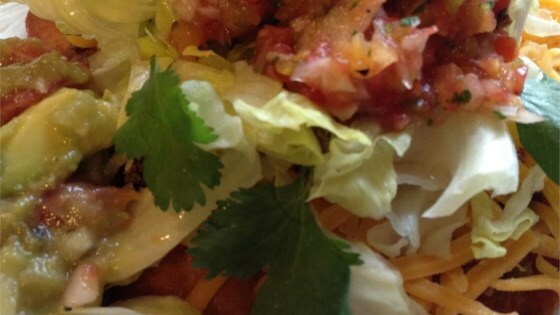 We are now addicted to these Indian tacos! Just great flavour and our guests are asking for them. Thanks so much for the recipe.